What looks like a slushy, feels like a slushy, but makes you wish you hadn’t eaten it? Microbes produce a wide array of pigments which colour everything from food to clothes. 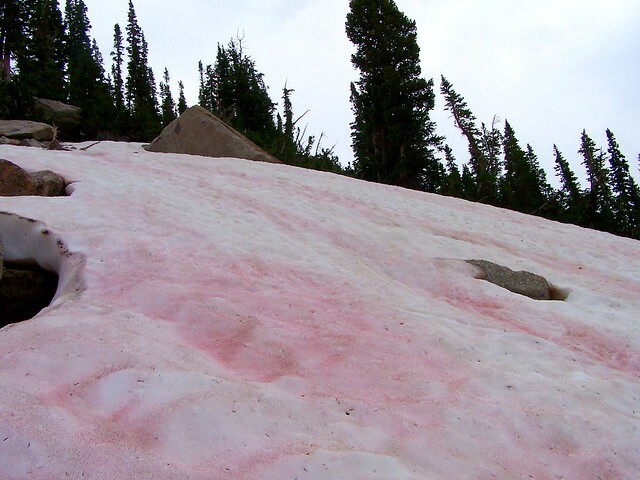 One of my favorite examples of pigmentation is the reddish-pink” watermelon snow” produced by the alga Chlamydomonas nivalis. As photosynthetic organisms, these algae must be able to harness the energy from light in order to stay alive, but like us, too much sun can make them “burn”. Therefore, the algae produce a red pigment sunscreen called astaxanthin which functions to take some of the extra light energy and convert it into heat. This extra heat melts the snow, not only directly making the temperature more amenable to growth, but also freeing up the nutrients which were previously locked up in the ice. This increase in nutrients can allow algae to grow rapidly - producing blooms just like other algae in the ocean when red tides shut down the shellfish industry - and increasing the “redness” of the snow further. Since watermelon snow has a lower albedo (reflects less light energy) than freshly-fallen snow, this can cause the environment to get warmer and warmer, enabling more algae to grow and more snow to melt. But while this increasingly pink snow looks like the perfect watermelon Italian ice, unless you want to make brown snow you probably don’t want to eat it!